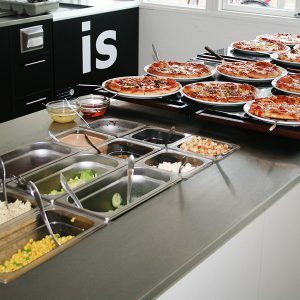 Enjoy our delicious pizza buffet with salad bar. Do you feel more like enjoying a juicy steak? Then you should try our rissoles. We serve juicy steaks, pizza buffet with salad bar, children’s dishes, ice cream parlor, etc. The cafe has a playroom and is placed only 50 m from the playground. The whole family can get something to eat and the adults enjoy a coffee while the kids play nearby. You can make your reservation here. Your booking is not valid until you have received an email confirmation (remember to check the spam filter).